Acupuncture is a complementary therapy that typically involves puncturing the skin with tiny needles in defined points to relieve pain and reduce the symptoms of many conditions. We have several physiotherapists who use acupuncture within the treatment/management plan of numerous conditions and also as an individual course of treatment by itself. All our physiotherapists using acupuncture are members of the Acupuncture Association of Chartered Physiotherapists (AACP) which ensures all members using acupuncture have received and maintain the necessary training to be able to use this therapy effectively and competently. 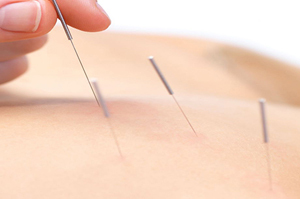 The needles used in acupuncture are very different from those used to give an injection or take blood for instance. They are much thinner and the method of insertion means often nothing is felt as the needle is inserted. However in some cases you may feel a very small, brief scratch/sensation. This depends on the type of problem, area of needling, type of effect desired, style of needling and many other factors. Needles typically range from 10 mm to 100 mm in length. Most will go in somewhere between 10 to 30 mm depending on location. I give blood regularly. Can I still do this if I have acupuncture? Yes – all our acupuncturists are registered to provide acupuncture using sterile safe sharps and conditions. If required you can be provided with a form detailing this to take with you to your donation. Is there anyone who should not have acupuncture? Your physiotherapist will complete a checklist of questions to ensure you are suitable. This depends on your problem and response to treatment typically people receiving Acupuncture will have 6-10 sessions to achieve optimum results. Treatment time for acupuncture typically lasts from 20-30 minutes. How safe are the needles? Should I drive after acupuncture? Some people can feel drowsy or lethargic after acupuncture and it is recommended that anyone experiencing these symptoms in the 10 minutes after having acupuncture doesn’t drive or use machinery immediately but have someone drive them home. Remember if you have any further questions please feel free to ask your therapist at any time. Our physiotherapists using acupuncture are all members of the AACP (Acupuncture association of Chartered Physiotherapists).